WHY OURS? 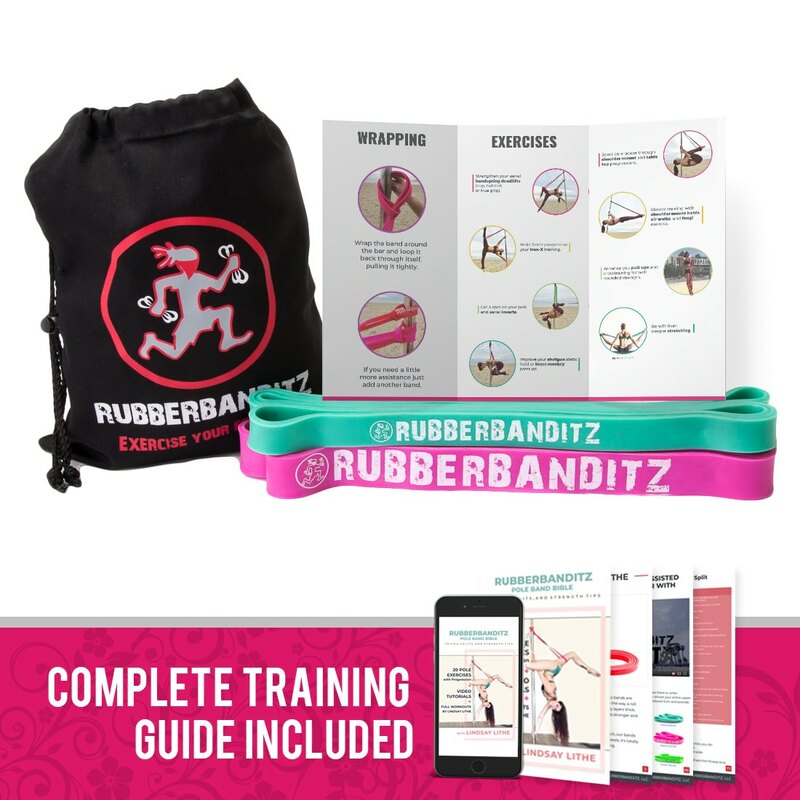 : >20 layers thick, free training eGuide, great for spotting assistance, lifetime warranty"
Make explosive growth in your training with these lightweight high-performance pole fitness bands. Each kit is equipped with a range of band tension levels that equip you to perform a multitude of exercises, both on and off the pole or apparatus. Each band can be used individually or combined to offer the right amount of resistance needed. 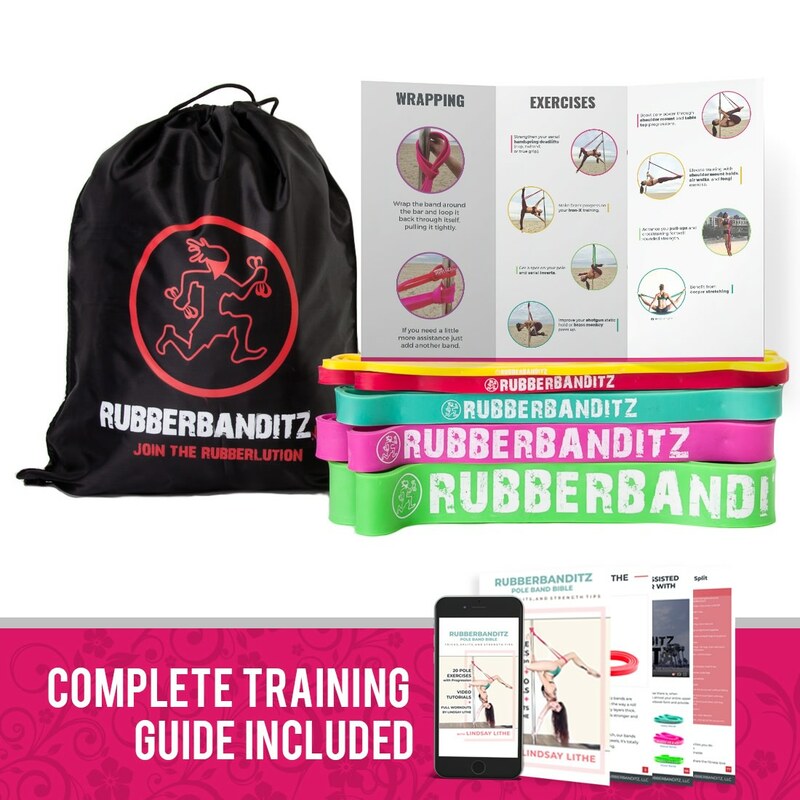 The yellow and red bands are useful for warm-ups and high rep exercises; the red, teal-cobalt, pink and green sizes are great for stretching and assisted bodyweight training. Regardless if you are a beginner or seasoned pro, you'll see dramatic improvements in strength, stamina, stability and flexibility! All kits include the pole training bible ebook. Elaborately dissecting movement patters of 20 pole exercises, this in depth ebook breaks down the movements with detailed instructions on how to correctly perform each exercise. Each exercise is accompanied by demo videos to help ensure proper form. 1) You can optimize the amount of resistance needed. Example: Try your first set with the #3 HEAVY BAND, then one set with the #4 ROBUST BAND, then one set with the ROBUST + MEDIUM BAND as you fatigue. 3) As you get stronger you can graduate to a different band. Example: Let's assume you were finally able to hold your Iron-X with the ROBUST BAND. Now it's time to train it with just the HEAVY BAND. How are our pole bands different? 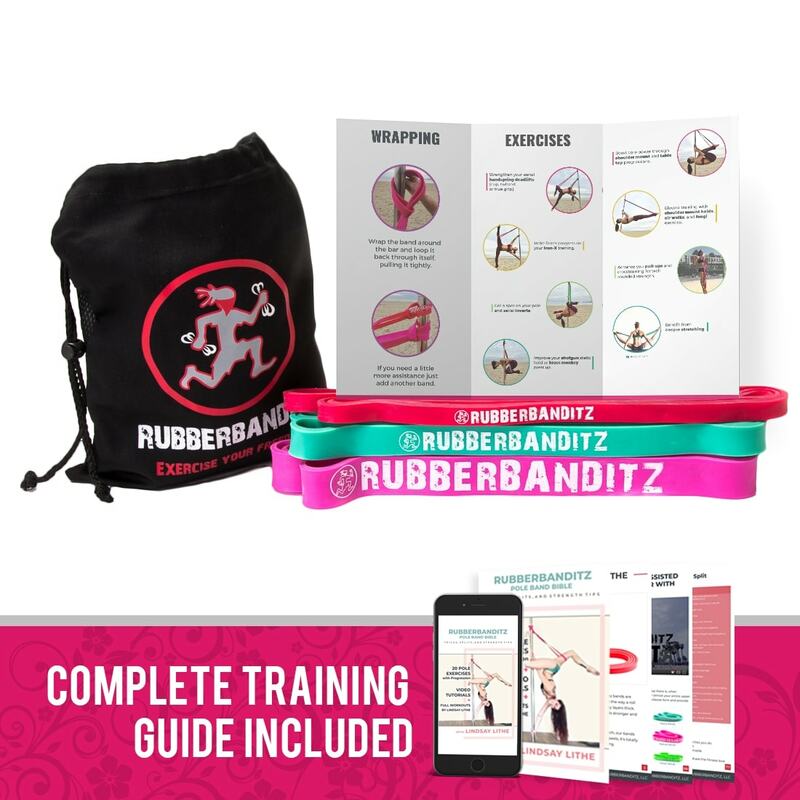 Unlike most normal resistance bands, which are made in a large factory and cast as a solid piece of rubber, our exercise resistance bands are made of premium Sri Lankan latex and crafted through a multi-layering process, like the way a roll of tape is wound up. Hi! Id like to know where your bands are made. Can you explain what each number band is used for? Im not sure if I should just get the Basic or deluxe set? INCREDIBLY fast shipping time (even internationally). High quality product, although for the price, I would have liked to see more detailed tutorials for exercises relevant to pole dancing.